This update is being sent to everyone as bcc to discourage the spread of Email addresses and spam. This project is still alive but progress has been painfully slow. The good news is that progress is again being made. There is no bad news. I'm a retired design engineer (33 years at Lockheed) and have worked on many projects from deep ocean to deep space. Engineers in general have a trait where they want to improve on a design. I have that trait and this project was undertaken to keep my mind active. I could be a docent at the local historical society, or volunteer somewhere else, but that would be sooooooo boooooring. Since the last update, Lodi Iron Works and myself ended up being at odds because they wanted me to pay for 2 castings that failed (1 failed because the core assembly procedure was not followed, and 1 failed because the water based mold wash was not dried). They wanted payment before proceeding, and I refused because the cause of both failures was "operator error", and not my fault. To make a long story short and after several Email exchanges between Lodi Iron Works and myself, the tooling is in my possession, I did not pay for the 2 failed castings, and Lodi Iron Works and I parted ways on friendly terms. I have aluminum match plates for connecting rods and main caps that fit the automated molding line at Lodi Iron Works, and I may need to use them in the future to produce these parts. From internet searches, I found 6 foundries in the Los Angeles area that appear to have the capability to make this casting. They are Globe Iron Foundry in Commerce, Mesa in Huntington Beach, Acme in Pomona, Covert Iron Works in Cudahy, Commercial Casting in Fontana, and Pacific Alloy Castings in Southgate. Of the 6 foundries, I have only contacted Globe Iron Foundry, and they are interested. I will be delivering the tooling for the cylinder block casting to Globe Iron Foundry on the morning of April 7, 2014, and plan to spend a week “on-call” to teach, assist, mentor, or whatever. 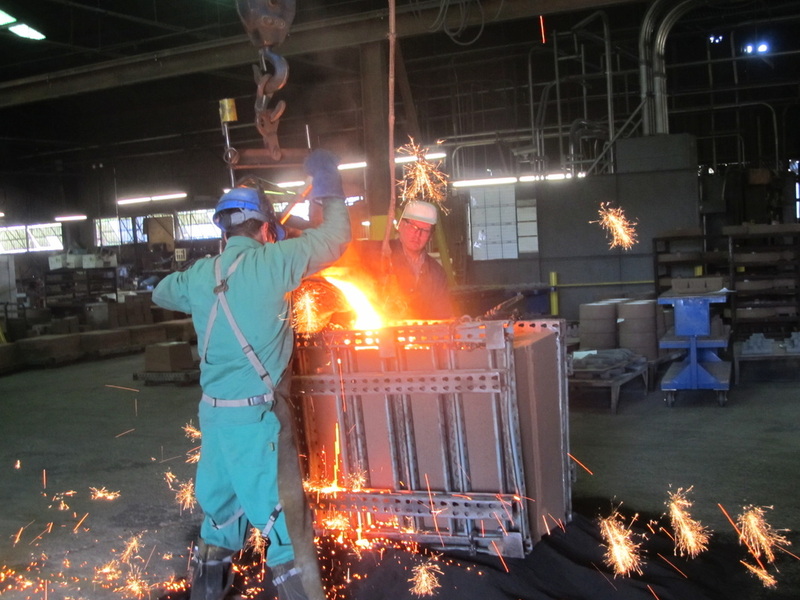 The attached picture shows pouring of the last mold at Lodi Iron Works where the water based mold wash was not dried (operator error). It looked like the 4th of July. The next step will be to have cylinder block castings machined. I need a source of good castings before I commit to having the SolidWorks machined model converted to machine language for a Mazak with pallets or equivalent. The next update should be much sooner.